Special care can keep your linen clothes in top shape. Linen has long been the natural fabric choice for warm weather garments. Its ability to "breathe" allows sweat to evaporate quickly, keeping the wearer comfortable in the hottest of weather. Linen, however, does have some drawbacks, including the high maintenance laundering it requires and its tendency towards wrinkling, shrinking and fraying. While you should always consult the care label for the particular manufacturer’s suggestions for care, most linen requires similar laundering techniques. You will need to decide whether to hand wash or machine wash your garment. If you hand wash, you’ll ensure that the laundering process is gentle, but if you machine wash, you should select the “Gentle” or “Hand Wash” cycle on your machine. If your linen garment is a colored fabric, stay away from washing in hot water to avoid color bleeding. Using the dryer should also be done with caution, as linen has a tendency to shrink. 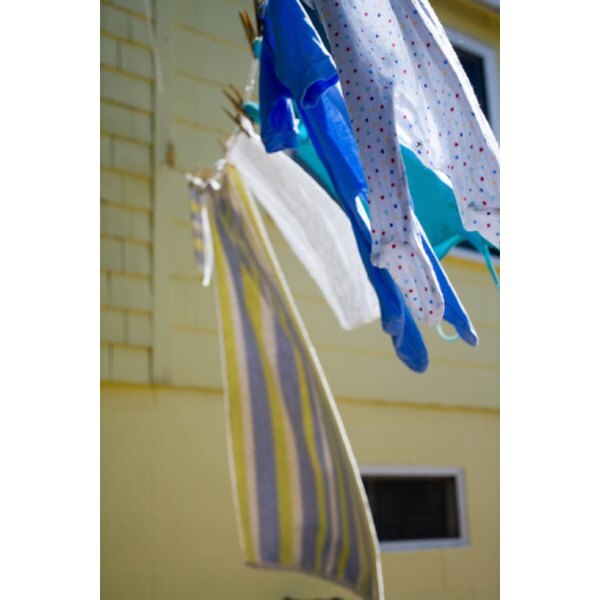 Air dry your garment by hanging it on a padded hanger, if possible, or use the lowest dryer setting to maintain size and shape. The number one word of advice for ironing linen is to make sure that your linen is damp when you begin to iron, making sure that the garment never actually dries completely until after you are finished ironing it. Turn your garment wrong side out to begin ironing, and, once that side is smooth, turn it back to the proper side and iron again. This will bring out the sheen of the fabric. You might also want to consider using spray starch to help you lock in the smoothness of the fabric as you iron. The most important considerations when sewing with linen fabric is to remember that it has the tendency to shrink when washed, and that, once cut, it tends to fray. Pre-washing your fabric before you begin your sewing project will ensure that you don’t create a dress or pants that, once washed, are too small to be serviceable. The fraying of this fabric when cut can be tricky to deal with, so you’ll need to give extra attention to finishing your edges. You may decide to use double-fold bias tape or a seam-finishing tape to enclose the raw edges. Iron all seams as they are finished, ensuring that your final product looks neat and professionally made. The number one way to fend off wrinkles in your linen garment while you wear it is to line dry your item rather than machine dry it. When all else fails, and your linen wrinkles as you wear it, then embrace this as the natural property of the fabric, attributing it to its casual, breezy nature. You might even consider creating your own intentional creases or wrinkles, just to reinforce to those who see you that you know perfectly well that your clothes are wrinkled, and that you’re going with the flow. Fabrics-Store.com: Sewing With Linen -- Everything You Need to Know to Make a Linen Garment!